ARMED with just seven employees, Shashank Nigam commands one of the largest airline branding consultancy firms in the world: Simpliflying. Today, Simpliflying works with over 75 brands around the world, making it one of the most successful aviation branding consultancy firms globally. Their clients include Singapore Airlines, Turkish Airlines, Latam Airlines, Emirates, Airbus, Boeing and Bombardier. But Mr Nigam's success did not come easy. Indeed, he was by all accounts a typical Singaporean graduate ready to join the workforce as a white-collar worker, graduating from the Singapore Management University in 2007. He got himself a secure job in the technology start-up Endeca, in Boston. Get a good degree, get a stable job, and settle down: that's the Singaporean way; but it is the very antithesis of being a good entrepreneur, said Mr Nigam. "There's something about the education culture in Singapore that doesn't encourage entrepreneurship." Speaking to The Business Times, the CEO of airline consultancy Simpliflying said he thought about settling down with his comfortable Boston job at the time. But a year and a half later, in the immediate aftermath of the 2008 financial crisis, he voluntarily quit his job and worked towards what would lead to the founding of Simpliflying. He merely followed his passion, he said. "I've always liked branding and airlines, so I decided to do some research to see if I could find an intersection of my two interests - airlines and branding - but I couldn't find anything on the Internet. "There were airline consulting companies that focused on the technical side of things - operations, network planning, flight operations and scheduling - but none on branding." 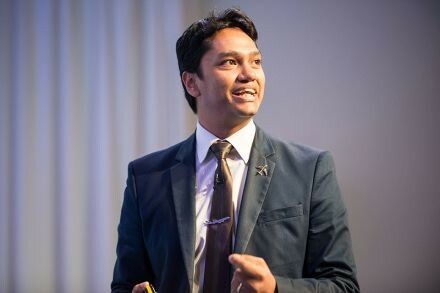 So while he was still working in Boston, Mr Nigam, spurred by his long-standing love for aeroplanes, started a blog and wrote articles analysing airlines and their brands. Within a few months, he realised that airlines were a unique industry and one cannot apply generic principles of branding to it. "With a can of Coke, your brand engagement is two minutes. With Starbucks, it's 20 minutes to an hour. With an airline, it can be anywhere from two to 24 hours depending on how long your flight is. Their respective branding methods are therefore not interchangeable." He took his insights and published a white paper, Six Steps to Building a Swashbuckling Airline Brand, which was soon put online, gaining him some level of recognition. It was then that he decided to quit his job. Quitting his job during the aftermath of the 2008 financial crisis seemed incredibly risky, but Mr Nigam says risk is only dangerous when one does not know what one is doing. He said: "The key is in asking yourself what the worst-case scenario is, and being able to accept it. I knew I had about S$20,000 in savings from my one and a half years of working in Endeca. This could last me eight months. If I could not break even before the money ran out, I would have to return to the job pool, and I was okay with that." Mr Nigam started by attending a series of conferences to increase his profile. "I was an outsider in the industry, so I had to make myself known." His big break came in March 2009 when a speaker backed out of a conference in Abu Dhabi at the last minute. Mr Nigam jumped in. He already had a marketing presentation prepared for such an occasion. Despite being an industry newcomer, he ended up snagging a prime speaking slot. The presentation ended up being the highest-rated presentation in the conference. "That was what got the conference organisers to call me again and again. There were CEOs and senior executives in the audience as well in the audience who were impressed." This opportunity enabled him to branch into offering consulting services to airline companies. As he puts it: "Luck only favours the prepared. You have to hustle, and create your own opportunities to succeed." But at that point, cash flow was still a problem. It was not until July 2009 that Mr Nigam got his first client: Winair, the national airline of Sint Maarten. Mr Nigam said: "The biggest step I took was in quitting my job. My advice for young entrepreneurs is to be bold and take the first step." Do you aspire to be a successful young investor? Are you keen on taking the first step towards achieving that? The BT-Citibank Young Investors' Forum is no typical page extracted from a financial textbook. This forum will present step-by-step guides on how to start investing, feature stories of peers who have made some headway with their investments, and provide answers to your burning questions on investing. First, we need you to invest - not your money, but your time - in reading The Business Times every Monday. You need not be an armchair reader either - write in to btyif@sph.com.sg now!